VeloVoices recently renewed its acquaintance with BMC’s Damiano Caruso at the Santos Tour Down Under won by teammate Richie Porte who turned up at the event looking lean, mean, motivated and loaded for bear, as did his team-mates. Damiano in an exceptional rider and one who is very important to our Tour de France team. He’s one of our best climbers and we expect him to do a great job of supporting our leaders in the coming three weeks. It was a natural decision to extend Damiano’s contract. After almost two years with BMC Racing Team, Damiano has become an integral member of the organisation. Sheree: A lot has happened since we last met. Damiano: Yes, the most important thing for me was the change in the team when I went to BMC. It was a totally new experience and it’s a really good team. Sheree: With a good group of Italians? Damiano: Si, Alessandro De Marchi, Daniel Oss, Manuel Quinziato. Yes, it’s a small group but we’re the Little Italy! Sheree: Not forgetting Massimo [who along with De Marchi and Caruso moved from Cannondale to BMC]. Damiano: (Smiles) The chef Massimo is very important in our team because he makes good food. Everybody likes good food. It’s especially important for Italians that they eat Italian food. Sheree: Do you find it easy to remain at your ideal racing weight? Are there any things you typically avoid eating or any dietary tips you’d like to share with us? Damiano: I eat everything, but only in small portions. Sheree: Tell us about your role on the team? Damiano: For the moment, my job is to help Richie. Richie is our leader so we will try to win the Tour de France. It’s important for him, for us, to give him our maximum. So my support for him is total. It’s good like this. Sheree: The win in Australia is good for his confidence, no? Damiano: Sure, but the Tour de France is in July. But to start the season in the right way is most important. Sheree: What races will you be doing, leading up to the Tour? Damiano: For me, it’s a little bit different to Richie. My programme will be Tirreno and Tour de Suisse, he’ll do Paris-Nice and Dauphine but the final goal is the Tour de France. Sheree: But you’ll be riding Vuelta al Pais Vasco? Damiano: Yes, it’s a hard race but it’s an important step to the Tour. Sheree: You’ve done well in races on Italian soil but which are the races you would most like to win and why? Damiano: I’m Italian so of course I’d love to win the Giro d’Italia. In general, I love the grand tours and I feel I go best over three-week races. There are some other different races that I like, such as Strade Bianche and also Tour de France. Sheree; If I were to ask your teammates about you, what would they say? Damiano: They’d say that I’m very chatty. I have very open and positive personality. That goes pretty much for life in general. And, of course, I’m very neat and tidy. Sheree: So how much mirror time does your roommate get? Damiano: I’m Italian, we’re vain but I really don’t spend too much time in front of the mirror. I don’t like to look as if I’ve tried too hard. Sheree: Ah, striving to look effortlessly chic – good strategy. Are there any places you’ve particularly enjoyed racing/visiting? Damiano: I love the mountains. I really enjoyed riding in Colorado, it’s just so big and, of course, the Dolomites. How could you not love those? I also love my home town of Ragusa in Sicily, that’s beautiful too. Sheree: Tour Down Under was your first trip to Australia. How did you find it? Damiano: Yes, first time and it’s a really good race ‘cos the weather is good, always in the same hotel – not so stressful. The stages are good – not so long – the summit stages are a bit more difficult than the sprint stages, so coming here is a good start for the season. Sheree: Do you have any personal ambitions this season? 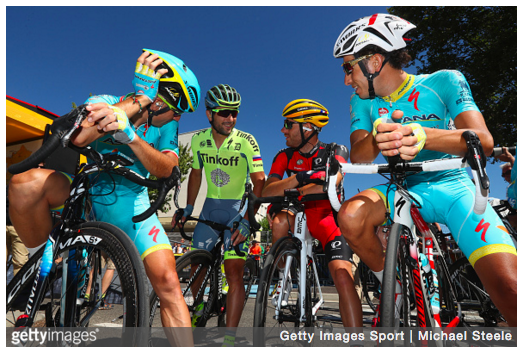 Damiano: Ah, I would like to win one race for myself but … [shrugs shoulders] I have to be ready to ride for Richie. You have to understand now the season is very long, this is very difficult. So anyway I want to try to win one race, so wish me luck. Sheree: I will and I’ll be keeping my fingers crossed that you get an opportunity to go for victory. You still live in your home town of Ragusa in Sicily, don’t you? Damiano: Yes, it’s important to live there with my wife, my son and with all my family and friends around me because you spend a lot of days away all year. So I like to be at home in my town and relax when I can. When I was younger I played football and I still enjoy it. In the off-season I used to go diving in the waters off Sicily – it’s so amazing. And I also liked fishing. But I don’t keep the fish, I throw them back. But the problem now is I don’t have time because during the summer we’re totally focussed on the Tour de France, our big goal. Then the last season I don’t have the time to go fishing or diving. I hope in the future I may have more time to do it. Sheree: Last time we spoke you joked that after your career as a professional cyclist you were going to be a kept man – a house husband. Damiano: Yes,I joke. For the moment I want to stay focused on my career. I hope for another four to five seasons at a good level and then we’ll see. Today was a hard and long stage, but I was feeling good all day, especially on the last, steep climb. The final kilometer was very fast and chaotic, and I was a bit unlucky there. I had hoped to have got a better result, but I was just not able to find the best line to go for the sprint against the leading group of riders. I want to thank my teammates for keeping me in a good position over the course of the whole day, and I am now looking forward to next week’s race. We wish Damiano and all the BMC team the best of luck this season!